As soon as the 2017 season ended, our good friend, Graham, tracked down a used J32A1 motor out of a 2001 Acura CL. With only a few months to complete this project before the 2018 season, we decided not to modify the motor and put it in as is. This is one of the lower power variations of the motor with an output of 225hp/217tq, but it was easy to find, inexpensive and a great candidate to work the bugs out of this new set up. The plan was to build a J32A2 motor on the side with some goodies from our partners at Supertech Performance and Brian Crower Racing while we do a few races with the J32A1. 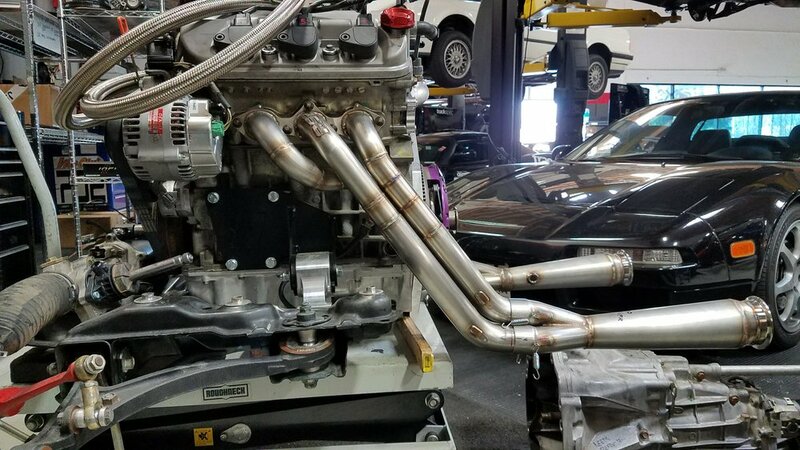 The J32A2 comes out of the CL Type S and has a stock output of 260hp/232tq, which will bring us closer to our limit of a 12:1 power to weight ratio class. The first step was to remove the F22 motor and dashboard to have better access for wiring. We also cleaned up all the grime in the engine bay and subframe from last season. 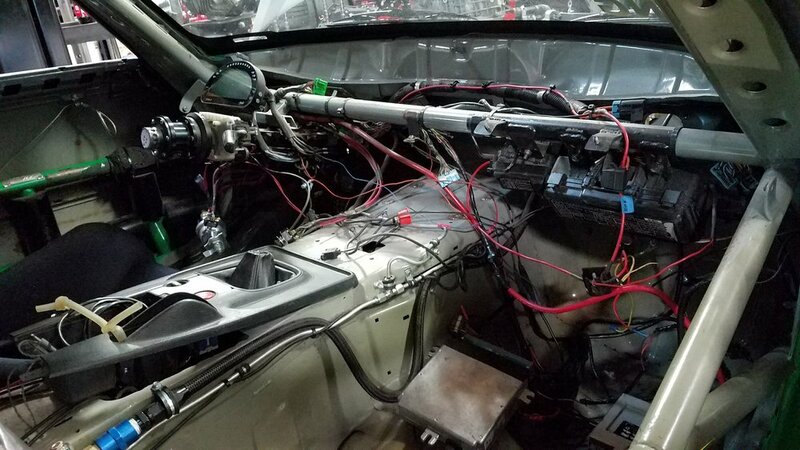 While waiting for the Hasport engine mounts and transmission adapter plate from InlinePro, we started getting into the wiring. 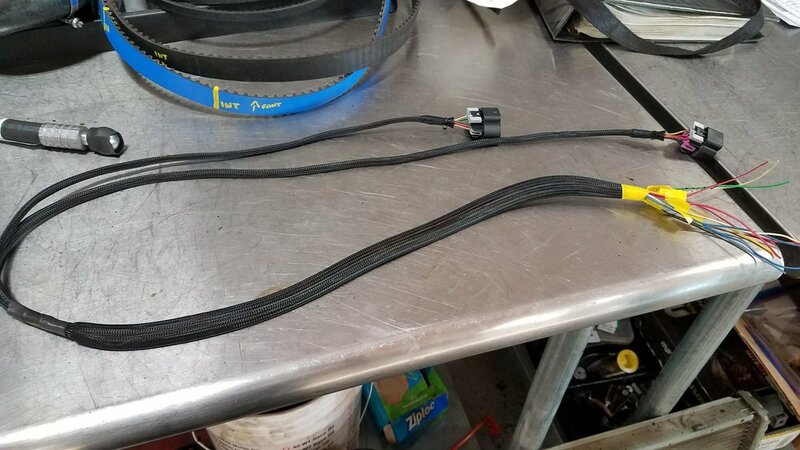 No one makes a wiring harness for this swap, so we had to do it the good old fashioned way and look up wiring diagrams. We would be using AEM's Infnity ECU for engine management, an S2000 Plug-n-Play harness, and the J32 engine harness. The goal was to make the J32 engine harness match up with the S2K PnP harness, which would then plug into the ECU. Comparing S2000 and CL wiring diagrams and pinouts. Removing unwanted wiring for automatic transmission controls and emissions components. As previously mentioned, we decided to keep the motor stock, but wanted to at least do some basic maintenance. We replaced the timing belt, water pump, spark plugs, seals, and gaskets. Removed original thermostat housing for firewall clearance and fabricated new coolant piping. Notched the oil pan for the starter and added a baffle in order to keep the Motul 300V 10w40 oil in all of the right places. Relocated brake and fuel lines away from the exhaust header. A little cut and weld and we are back in business. 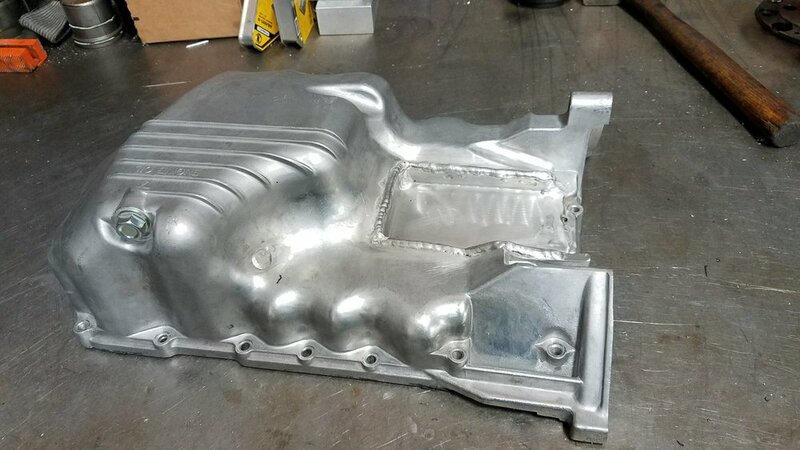 In addition to modifying the intake manifold, we needed to cut away some of the hood for clearance. We added some Zero Factory heat extraction vents while we were at it. Fabricating a Y-Pipe to connect the two headers to the original axle back muffler. 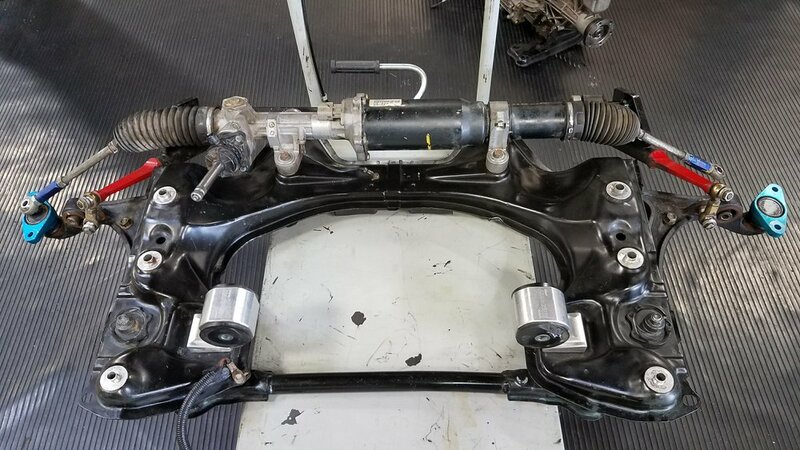 The old diff recently gave out, so we enlisted Tom's friend Ben from Puddy Mod in Florida to help build a new one with a J's Racing 1.5 LSD, fresh seals and bearings, WPC treated gears, and a taller final drive to go with the extra torque of the J32. And of course, Motul 90PA differential fluid because it's the best at handling high temperatures and repeated abuse from racing. We knew we would be under power with this motor, but wanted to get a baseline weight before heading to the dyno. 2,576lbs is where the car sits without the driver or fuel. Special thanks to Jei at Blacktrax Performance for getting Irene tuned! "Irene" showing off her new shoes: Advan RZII wheels in 18x9.5 +42. We are now partnered up with Yokohama Wheel for the 2018 season and thrilled to be using their badass, lightweight, and very strong Advan wheels. The dotted line shows Tom's old F22 dyno plot compared to the J32. Not much gain in peak horsepower, but plenty more across the entire RPM range. The torque was a huge gain as expected. We dropped the front splitter down about 2 inches and added an air dam. The splitter had to be trimmed back to maintain the allowable 4 inch length. Check out our new tech article on corner balancing! Morning arrived, and after filling up "Irene" with some delicious-smelling VP100 race gas we were ready to get started. Two laps into the first session and Tom radioed to tell us that the car was stuttering. He limped it back into the paddock and Jon began looking for the problem. After firing up our AEM Infinity management software, we confirmed the issue was with a custom drive-by-wire configuration; so we decided to just go back to the "off the shelf" GM configuration for the day until we have time to work through the problem later with Jei. Tom went back out and began to gradually build up speed. We saw his lap times drop from the 1:30s to the 1:25s after the next session. When he came back in, he had a big smile on his face. Tom said the car "felt really good, well-balanced, and neutral." He "couldn't really tell that there was a bigger engine under the hood when braking into corners," or when he would drive "through the more technical parts" of the track (Thunderhill West has a lot of rapid transitions). To him, "the handling characteristics felt the same as before" which is a testament to the car being well-sorted and dialed-in. As the day went on, Tom began to push the car more and more. His lap times continued to drop down into the 1:23's. He continued to describe the car as "easy to drive, very predictable, and progressive." Tom said he "loves the torque of the J32" and "the sound is just intoxicating!" We asked Tom if he felt that he needed more revs, since the J32A1 only goes up to 6,800RPM but he said "no, while more revs would be nice the car pulls hard as is because it makes most of its power before 6,000RPM anyways." Fortunately, Tom has driven with a bigger engine in his S2000 before; a few years ago, he ran a stroked F2.5L that only revved to 7,000RPM so he's used to adapting to a lower redline already. After lunch, Tom recorded a new personal best (1:22.338) on the West course and with that we felt our goals for the day had been met: he felt really comfortable in the car, we identified some small things that we want to improve, and all-in-all the months of hard work had paid off; "Irene" is now faster than ever and we definitely seem to be on the right track for the 2018 season! Overall, we had a great time, and despite some initial hiccups in the morning, we considered this day to be a success because we met all three of our goals: 1) The car ran well the whole day and sounded great, 2) Tom was able to quickly adapt to the new setup and improved his times tremendously throughout the day, and 3) We were able to detect some minor issues that can be addressed before the race this weekend. On Friday March 16th we loaded up at the shop, and headed up to Sonoma Raceway for our compliance dyno appointment at TFB. "Irene" made similar horsepower to what she put down at Blacktrax: peak 234whp and 223 ft/lbs. By using NASA's calculation form, we ended up with an average of 229whp. Pretty good, considering this J32A1 engine was supposed to be our temporary solution while we sourced a J32A2 engine which will be built with Supertech valves, retainers, and springs. After finishing up at TFB, we drove down to the paddock where we spent an hour calibrating our new fuel sender unit. After two seasons with an AIM MXL2 dash and no fuel gauge, we finally decided it was time to wire something up. Fortunately, we recently installed a Radium Engineering dry-break coupler so draining fuel from the tank and specifying how many ohms the float was reading is now super easy. Morning arrived, and after getting "Irene" warmed up it was time for practice. Since it had rained just a few hours earlier, the track was really damp and quite treacherous. Tom actually had a few tank slapper moments out on track and even spun the car twice; once coming down the carousel and another time exiting Turn 7 before Turn 8 (both times he managed to keep it on the pavement though). Phew! The drivers' meeting was pretty uneventful. They just talked about the new rules, and updated processes for submitting class and dyno forms. Due to the weather, and probably many people's schedule conflicts there were only 6 cars in class for ST4. Qualifying was still damp and not ideal. The session ended up getting cut short due to a Spec E46 that crashed and flipped over in the carousel (T6). As such, they did a full course black to bring everyone in early. Tom was able to put "Irene" in P2 with a time of 1:56.290 behind the EDGE Motorworks E36 M3 driven by Andre Eisenbach who did a 1:54.292 for pole position. Rolling over the scales after qualifying (required). Victoria had the incredible foresight to plan for hot pot at the track; which was perfect since the weather was cold, wet, and miserable. In fact, it hailed just 20 mins before the race! So when Tom went out to grid up, he was nervous about the conditions because he was on dry tires (we didn't bring wets). Fortunately, the sun came out and dried up most of the track right before they threw the green flag. And wow, what an exciting race! Tom fought his way up to the lead by passing Andre in T6 of Lap 1. The two of them would continue to battle nose to tail for the first half of the race, with Jon Burgis not far behind in 3rd. However, Tom began to struggle for pace and after giving up positions to first Andre, and then to Jon, his car suddenly began to sound funny and almost immediately Tom radioed in that he was going to limp the car back into the pit because he had lost almost all power. Right as he got to the paddock the engine died completely, and would not restart. What a bummer, because he had been doing so well. Drew, Jon, and Son began to diagnose what was wrong and they quickly discovered the culprit: a dropped valve. Our guess is that because this J32A1 was only a refreshed (temporary) junkyard motor, it really wasn't up to the task of race-abuse. We decided to pack up and head home, anxious to get started on the J32A2 engine that would be capable of handling the rigors of wheel-to-wheel racing. The very next day, we went down to Morgan Hill to meet up with Liam and Graham to grab the J32A2 engine that they had sourced for us. Thanks, guys! Two hours later and we were back at the shop. Jon and Tom got the engine onto a stand, and they gave it a quick pressure wash and dry before taking the head apart to measure the valves, springs, and retainers. Next up: Supertech is going to make us some sweet inconel and titanium goodies and we'll be back in business! 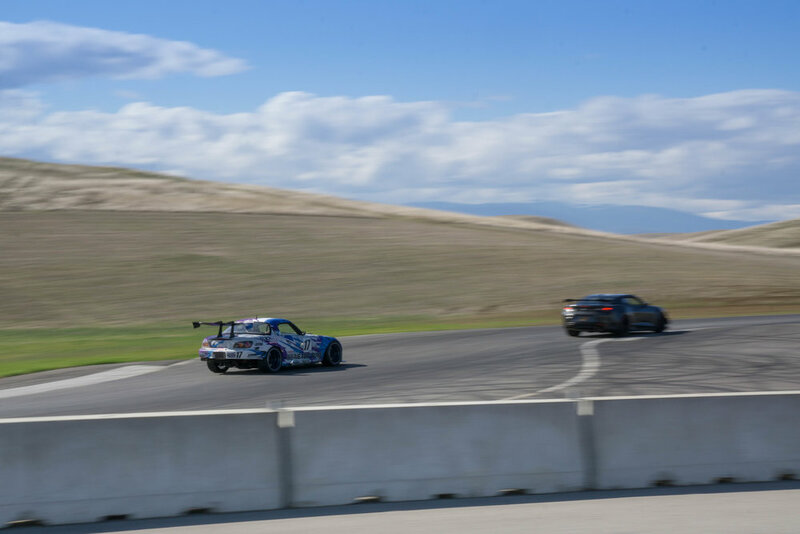 Check back in mid-April for a recap of Round 2 at Thunderhill Raceway. We'll be busy preparing in the meantime!